Secretary of the Board of Trustees of the Peoples Democratic Party, Chief Ojo Maduekwe , is dead. Maduekwe, who served variously as Minister of Culture and tourism, and Minister of Transport in the Olusegun Obasanjo administration and also Minister of Foreign Affairs in the Yar'Adua administration, died at the age of 71. A former Nigerian writer Elechi Amadi has also died. Chie Maduekwe,a former National Secretary of the Peoples Democratic Party (PDP), who served in all the PDP governments between 1999 and 2015, died yesterday in Abuja. He slumped inside a vehicle on his way from the Nnamdi Azikiwe International Airport. According to a family source, “The ex-minister was at the airport to receive one of his children who graduated with honours abroad. “After welcoming his child at the airport, they headed for Abuja city but on the way, he suddenly developed health complications. “He was rushed to a private hospital in Asokoro District. He never made it as he was pronounced dead at the hospital. .
Maduekwe, a lawyer, politician and non-career diplomat, is not a man you can forget in a hurry. He was as controversial as they come, but he was also a man of wit, humility, and a public servant who served Nigeria religiously in the last 17 years of his life. He was appointed minister of culture and tourism by President Olusegun Obasanjo (“my mentor forever,” he used to say) in 1999. He was moved to the transport ministry in 2001, and went on to become the secretary of the Peoples Democratic Party . In 2007, President Umaru Musa Yar'Adau appointed him minister of foreign affairs – during which Maduekwe introduced the concept of “citizen diplomacy” to focus on the well-being of Nigerians abroad. 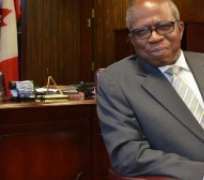 He was removed as foreign minister by then acting President Goodluck Jonathan in March 2010, but he bounced back as high commissioner to Canada in 2012, a position he occupied until 2015 when PDP lost power. Chairman of the Board of Trustees (BoT) of the PDP Senator Walid Jibrin lamented Maduakwe's death when he spoke with reporters on the telephone from Saudi Arabia where he is performing the lesser Hajj. Maduekwe's last job was as Secretary of the BoT. Secretary of ex-PDP Ministers Forum, Prof. Abubakar Olanrewaju Suleiman, said last night: “It is sad that we lost one of our finest men at a crucial time. I am shocked beyond words. “He was one of the few conscientious leaders we had left because you cannot buy him with money. This was why we made him the Secretary of the BOT. Former Anambra State Governor Peter Obi described Maduekwe as an unusual politician, who was not afraid of his own voice, especially in speaking out on matters bordering on the way forward for the country.” If he was brutal at certain points, it was just an insight into the depth of his passion,” he said. Maduekwe who was born in Mbaisie, Abia State on May 6, 1945, was appointed culture and tourism minister by former President Olusegun Obasanjo in1999 and Minister of Transportation in 2001. In this position, he advocated greater use of bicycles, although critics said the roads were unsafe for cyclists and Maduekwe himself was pushed into a ditch by a bus while cycling to work. In 2007, the late President Umaru Musa Yar'Adua appointed him Foreign minister. He held this office till 2010 when acting President Goodluck Jonathan dissolved the cabinet. In 2011, he worked as the deputy director of PDP presidential campaign 2011 Goodluck/Sambo ticket. He was appointed as High Commissioner to Canada. Maduekwe got a fair share of media bashing, and controversy never departed from his doorsteps. As minister of transport under Obasanjo, he had recommended that Nigeria should explore every means of transportation, not just buses and cars. He suggested the use of bicycles – which is very common in the advanced world and is considered to be environment-friendly. The headlines the following day were damaging: “Maduekwe says Nigerians should go back to using bicycle.” The general opinion was that he was taking Nigeria back to the Stone Age with this proposal. Some journalists nicknamed him “Ojo oni keke” (Ojo the cyclist) in jest. But he nearly got himself killed while trying to lead the way. He started the habit of riding bicycle to the weekly federal executive council (FEC) meeting to create awareness (this was long before Boris Johnson became mayor of London and popularised cycling to office). On his second try, Maduekwe was knocked down by a commercial bus. He smelt a rat and stopped cycling on the roads of Abuja. Death has also been announced of one of the foremost Nigerian writers, Elechi Amadi. Amadi, who hails from Ekwer, Rivers State, passed away at the age of 82. He at the Good Heart hospital in Port Harcourt. Vanguard reports that Bar Wabueze Amadi who is a member of the family confirmed the passing away of one of the Africa's first generation writers. He worked for a time as a land surveyor and later was a teacher at several schools, including the Nigerian Military School, Zaria (1963–66). Amadi served in the Nigerian army, remained there during the Nigerian Civil War , and retired at the rank of Captain. He then held various positions with the Rivers State government : Permanent Secretary (1973–83), Commissioner for Education (1987–88) and Commissioner for Lands and Housing (1989–90). He has been writer-in-residence and lecturer at Rivers State College of Education, where he has also been Dean of Arts, head of the literature department and Director of General Studies.